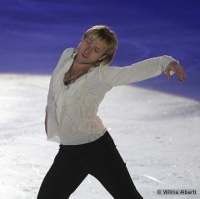 Dima Bilan and Edvin Marton composed Olympic anthem in honor of Evgeni Plushenko "I can"
Женя, желаю тебе здоровья и вдохновения! Желаю тебе выиграть еще две золотые медали! И миллионы ангелов тебе в помощь! Good - there is 2 mp'3 for download ... maybe you blocked pop-up windows? Gooooo Zhenya! I've been absent from this forum for a while but have been lurking to check up on Plushy's competitive news. Am so psyched that he'll be competing! Honestly, it's such an honour for the other athletes that they'll be sharing the ice with a legend. And dont forget - go there and support Plushy! Дорогой Женечка! Просто делай свою работу.И все получится! Мы тебя очень любим и будем поддерживать со всех точек земного шара!